Advertising on-line not only has lower monthly costs than the typical print media but it gives much better targeting of an audience specifically looking for information about gay Chiang Mai. Advertising in free gay magazines, businesses will only reach a few customers, who have typically already arrived in a Chiang Mai gay venue to pick up a copy. 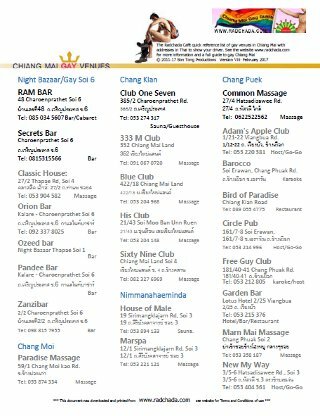 On-line advertising allows you to directly locate customers who are trying to find information about gay Chiang Mai in an early stage of their decision process about coming here, where to stay and what to do. Moreover, they will likely visit our website on smart phones and tablets whilst in the city to get updates on the locations of various places.